a conservation business which conserves (restores) antiquities. I do a lot of finish (painting, shellacking) work in our business. 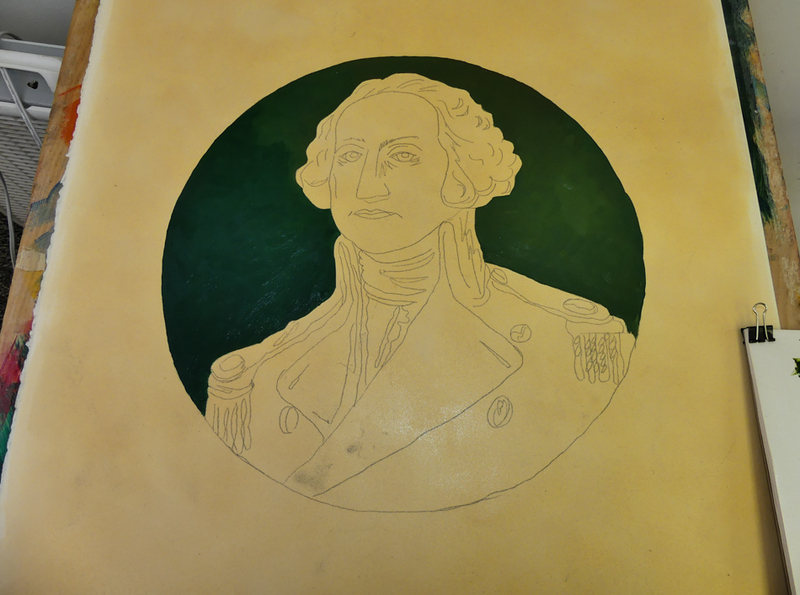 The DAR approached us to recreate the First Flag of Washington in order that the historic flag which hangs in the Reception Room of the Legislative Building be preserved. I thought you might find this interesting… My other identity! If you want to read about the prep for the drafts, below, go here. 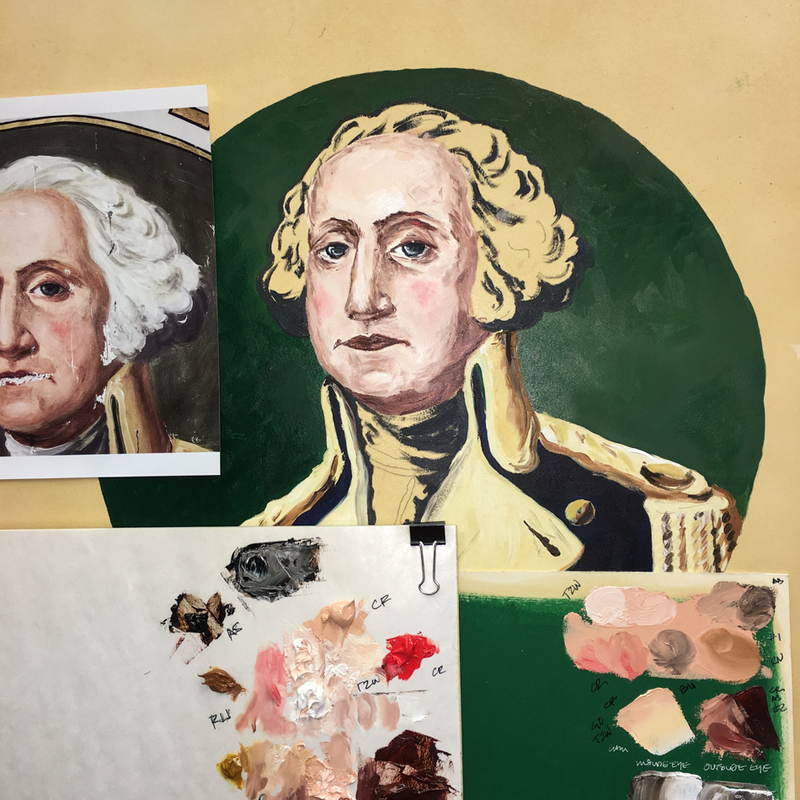 I created draft of George, oil on paper. The paper was primed with shellac to prevent oil seepage. 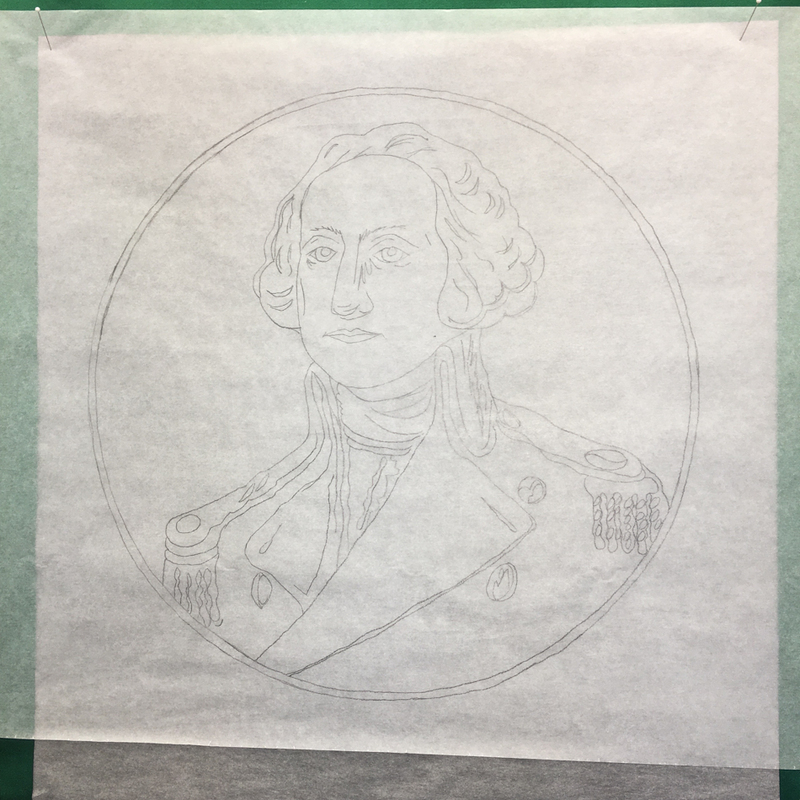 New tracings from our master tracing are created each time so the marks are fresh. 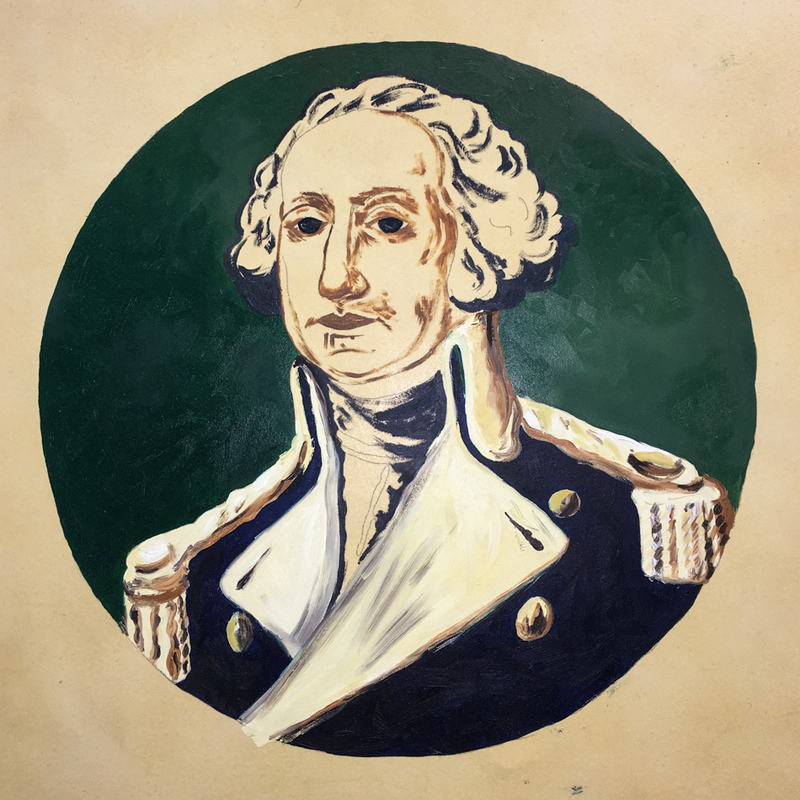 My first draft was a portrait of George on plain shellacked paper. The lovely background is not noticed much in our original because the original bright green silk has faded to the colors of the background. 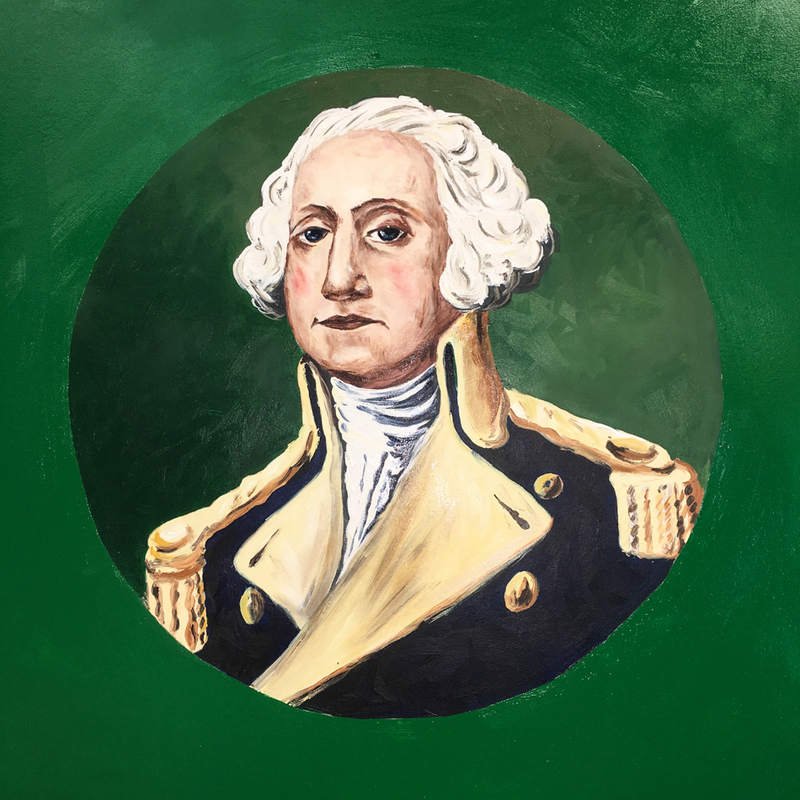 The background was created so that it appears a light is coming from behind George. 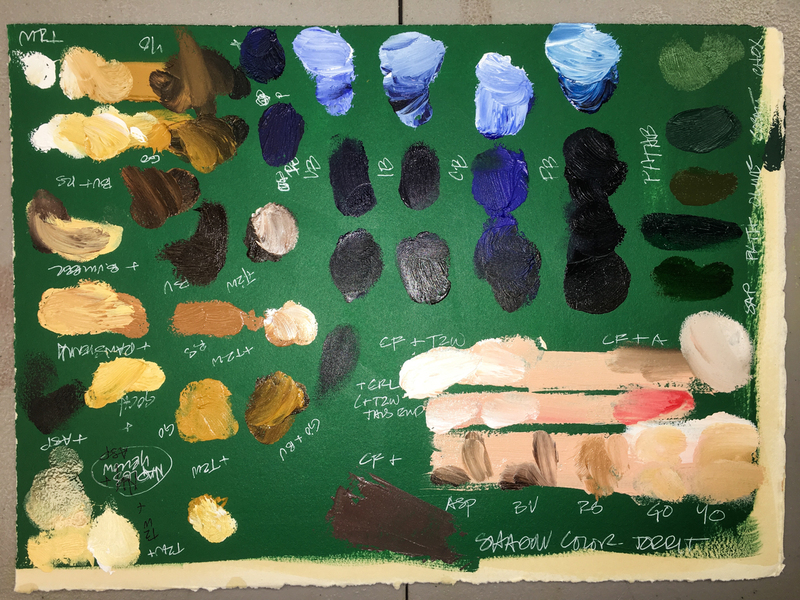 The draft on shellacked paper helped to fine tune the paint formulas. Okay, I had a bit of fun at the end of the day giving him cat’s whiskers! The original paint mixes when painted in the portrait draft were changed slightly. I painted the draft slowly, using the the 50/50 galkyd/linseed mix to thin when needed. The next four images were done in one day, so the shadings were created properly. A few final tweaks, and the first test is completed, shown here against the original. A second test was on green painted paper to work the colors again, over green. the green tint bleeds through the paint. 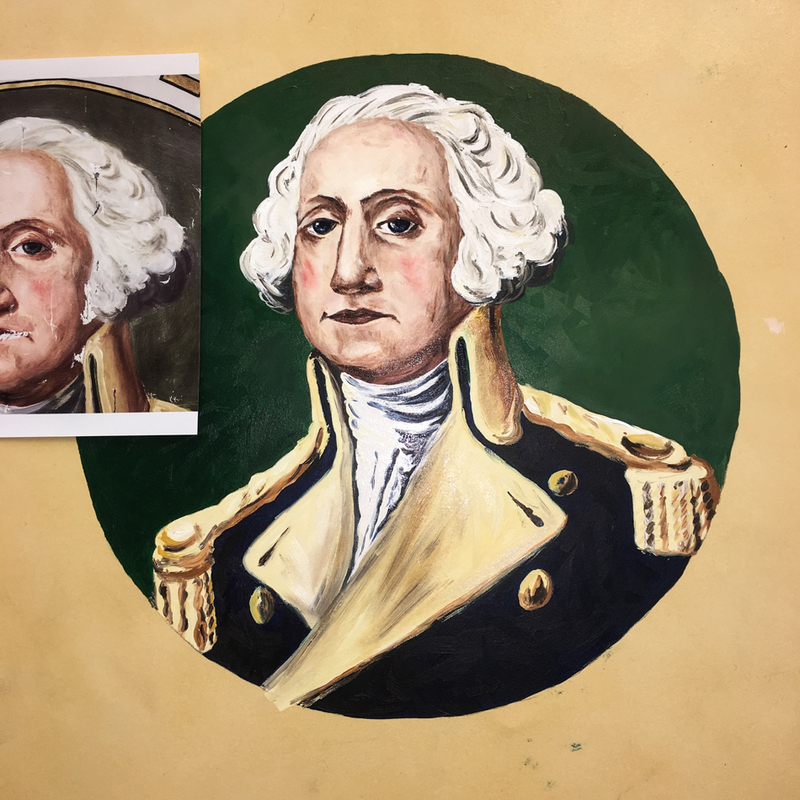 Green George gave us laughs as his eyes followed us everywhere; I was a bit sorry to have to finish him! no matter how I attempt to reproduce it. What I want is his eyes to look at you in the manner of the flag and his smile (which has degraded) to be accurate to his personality. We thought that they may have copied a famous painting. an amalgamation of two or three images we’ve found. If anyone has any further history we’ll be happy to share that in this post..
really nothing I’ve done to date has been quite like it. the paper tests and am now ready for the silk, next post! 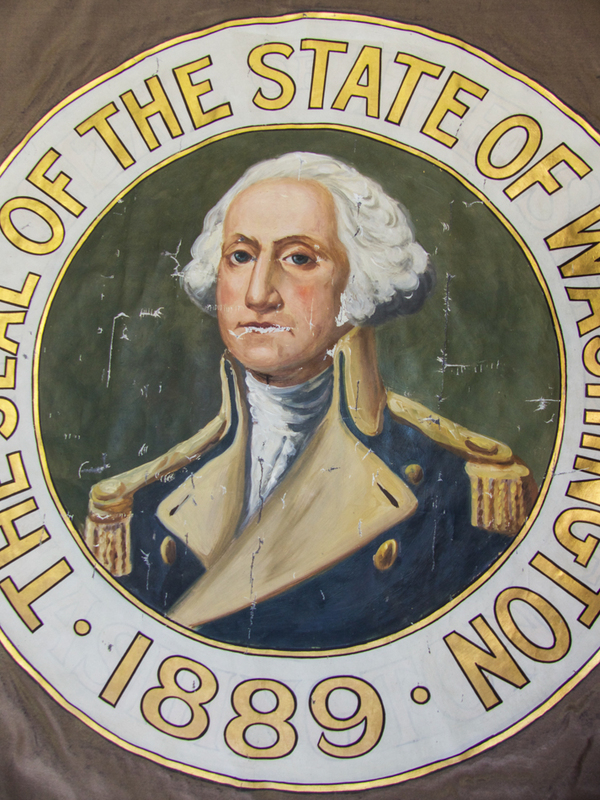 To begin at the beginning, visit Washington State Flag, 1. 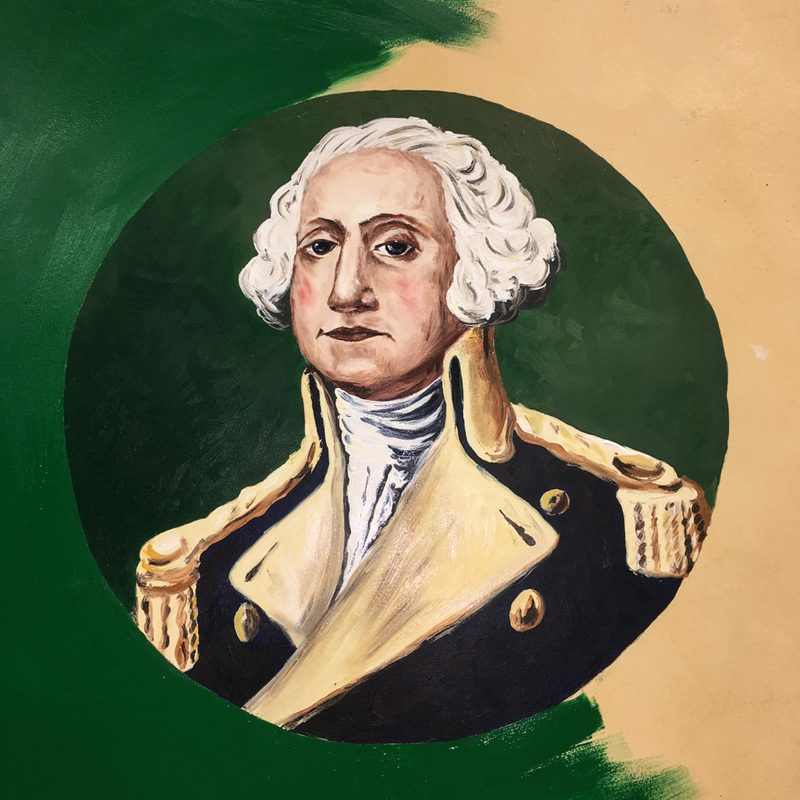 This entry was posted in commission, history, oil paint, painting, portrait and tagged #DARstateflag, #gamblinartistcolors, #gamblinoilpaint, #mpfconservation, #replication #paintingonsilk, #washingtonstateflag, DAR, flag, MPF Conservation, painting on silk, replication, State Flag, Washington history, Washington State DAR, Washington State Flag. Bookmark the permalink. My goodness! This is wonderful. 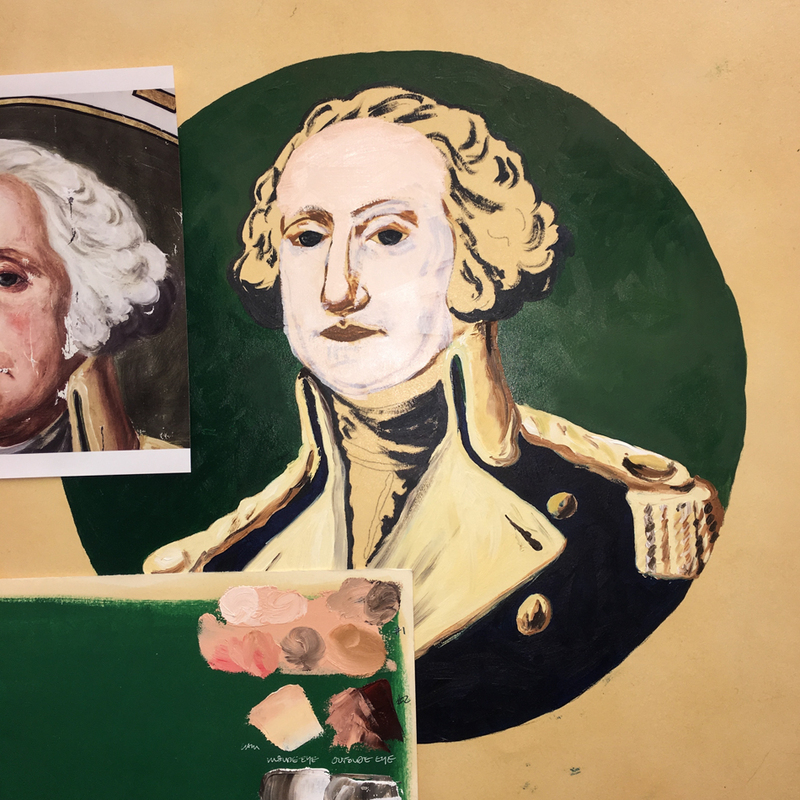 I loved seeing how you progressed to the finished painting. You are such a talented artist. Thanks Beth! There will be more as i am now working on the silk versions…. Thank you… There will be more on this process!